This past summer I accepted a small position teaching a few music classes at a playschool each week. Although I have experience with children from 1st grade all the way up to seniors in high school, teaching music to 2-4 year olds was going to be a new challenge! 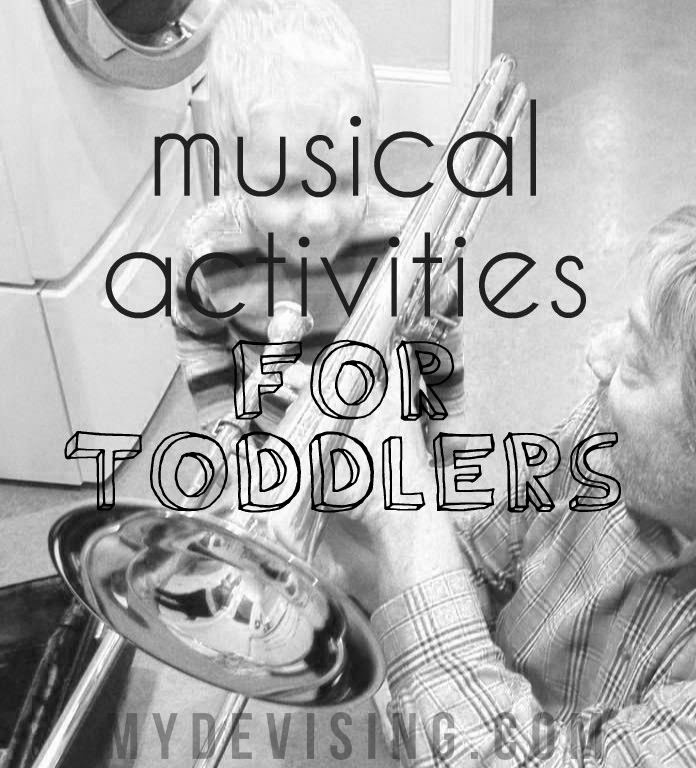 I wanted to compile a small list of a few specific ideas for those of you that are at home and would like to involve music into your toddler’s life. Simply singing together is great, but it may be helpful to have some additional ideas as well. 1. Sing books. Some of my favorites are The Wheels on the Bus, Snuggle Puppy, The Fox, A-Hunting We Will Go, and The Three Little Kittens. We even add melodies to books that aren’t technically supposed to sung. Children love hearing our voices. 2. Play instruments. Purchase some cheapy instruments (jingle bells, shakers, rhythm sticks, sandblocks, etc.) or just make your own. Turn on some music and let your toddler go to town. If you want to do something more focused with it, then try keeping a steady beat with the instrument. Or play different instruments with different sections of the song. This can be as non-structured or as structured as you want it to be. 3. Sing songs with movements. Add movements to the songs you’re already singing to your child. A specific kind of movement you can do would be to mimic the instruments that you hear. If you hear a violin, then play your pretend violin. Or just focus on the songs that have built-in movements already – If You’re Happy and You Know It, Hokey Pokey, Itsy Bitsy Spider, Deep and Wide, etc. It’s a great skill for them to be able to sing and move. 4. Play games with songs. Turn on some music, have your child move/run around, and when you pause the music, have them freeze. Toddlers love this kind of activity. (And it burns off some energy for naptime, which we’re all fans of!) Find some songs that vary in tempo (fast and slow) or dynamics (soft and loud) and assign different movements to each one. For example, run when it’s fast, walk when it’s slow, stand tall when it’s loud, sit down when it’s soft, etc. The only goal is to encourage your toddler to enjoy music. If you’re having fun, they will too! Claire is a mom of two and blogs at My Devising. Next Post Fall Break 2014!